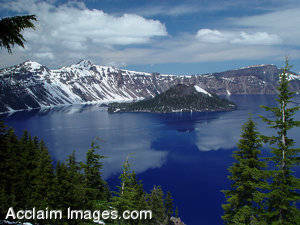 Description: Stock Photo of Crater Lake in Southern Oregon. A beautiful spring day at Crater Lake National Park with blue sky and fluffy white clouds reflecting off its water. Crater Lake is the deepest lake in the USA. This photo may be licensed as stock photography. It is also available as an art print or poster.